Travel brochure for the Lloyd Trestino "Round Trips to the Levant," 1930. Signed "Claris" and "tipografia del Lloyd Triestino - Trieste. 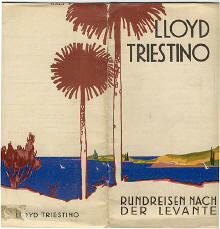 Travel brochure "Lloyd Triestino - Aegypten = Reisen zu ermässigten Pauschalpreisen," 1929. Signed "Claris." 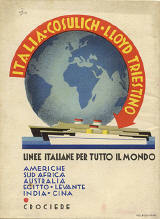 Adver-tisement for "Italia - Cosulich - Lloyd Triestino - Linee Italiane per Tutto il Mondo," circa 1935. Travel brochure "New York - Mediterraneo en Seconda Classe," circa 1930. Printed by "Soc. Stab. Arti Grafiche Alfieri & Lacroix, Milano." 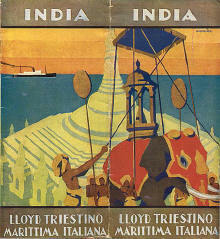 Travel brochure "India - Lloyd Triestino Marittima Italiana," 1930. Signed "Giordani." 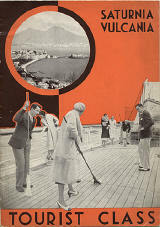 Travel brochure for the "Cosulich Line - Tourist Class - 'Saturnia & Vulcania,'" circa 1930. Published by the "Cosulich S.T.N., Trieste." Front cover. 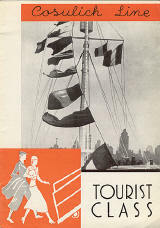 Travel brochure for the "Cosulich Line - Tourist Class - 'Saturnia & Vulcania,'" circa 1930. Inside page. 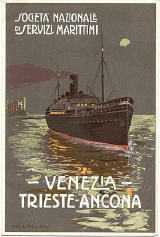 "Venezia - Trieste - Ancona," published by the Societá Nazionale di Servizi Marittimi, circa 1912. Signed "Stab. A. Marzi - Roma."